When it’s your turn, you are the Caster and you get to choose your Victim. The turn ends when the Victim responds. If you’re not paying close enough attention, keeping track of who’s attacking and who’s responding and which order things are moving proves a bit of a challenge the later the evening wears on. As long as you have one person capable of maintaining their wits (in spite of the beverages and the ravages of Cthulhu) you should be fine. Cultists attack each other with the hope of stealing sanity tokens. 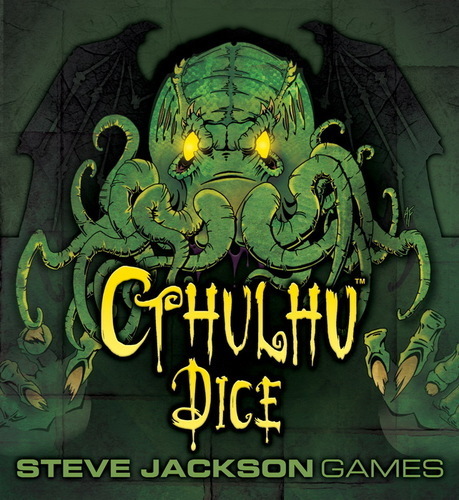 More often than not, however, it is Cthulu who benefits from the dueling Cultists. Each time anyone rolls a Yellow Sign, Cthulhu gains a sanity token. If you roll a tentacle, the Caster gets to steal sanity from the Victim, even if the Victim rolls the tentacle. Tentacles are nasty like that. If you are mad (having lost all your sanity tokens), you can only regain your sanity from Cthulhu by rolling an Elder Sign. 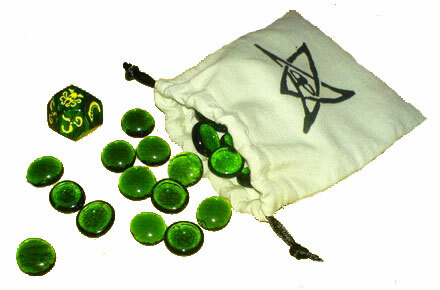 Since there’s only one Elder Sign on the die, most mad Cultists tend to stay mad (and Cthulhu chuckles in his sleep). The game ends when one Cultist remains with at least one sanity token at the end of a turn. If no Cultists have managed to retain their sanity, then the mighty Cthulhu has won, and the world’s sanity is lost. I really enjoyed this game, and only have a couple of complaints. The established language of Caster and Victim is not always adhered to in the instructions, but I’m pretty sure we inferred correctly in the few instances it deviates. 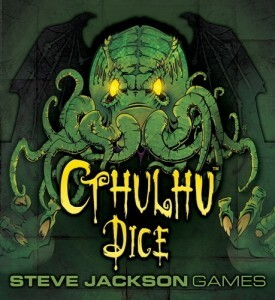 Mostly though, I’d much rather see one more tentacle and one fewer Yellow Sign on the die. Much of the fun of this game is in stealing sanity from fellow Cultists, and with so many Yellow Signs, Cthulhu tends to gain our sanity a bit too quickly. Guest Review By: Joelle B.